Hamm's CompactLine of rollers have drum sizes ranging from 31 to 54 inches wide. At World of Asphalt 2018, the CompactLine was represented by the 3-ton HD 12 VV with two 47-inch-wide vibration drums, and the 1.8-ton HD 10C VT combi roller with 39.4-inch smooth drum in front, and four rubber tires at the rear. Models of the CompactLine, with drum sizes from 31 to 54 inches wide, are functional yet user-friendly, and quiet yet powerful. These articulated tandem rollers offer big-time compactive effort in a small package equally at home for patching, commercial or roadbuilding applications. The CompactLine includes the HD 8 VV, with a drum width of 31.5 inches; the 39-inch HD 10 VV and the same-dimensioned but lighter-weight HD 10 C VV; the 47-inch HD 12 VV; the 51-inch HD 13i VV; and the 54-inch HD 14i VV. Each offers an offset capability to enable compaction right up against a curb without risking damage from the trailing drum. The HD 10 VT, HD 12 VT, HD 13i VT and HD 14i VT are combination models with smooth drum in front and four smooth pneumatic tires in rear. Exclusive Hamm oscillation compaction also is available in Hamm's CompactLine. These oscillation compactors include the HD 10 VO, HD 12 VO, HD 13i VO, HD 14i VO and HD 12 VO rollers, which feature standard vibration in the front drum, and oscillation in the rear. VV stands for "Vibration Front, Vibration Rear", in which both drums offer vibration, with the capability of vibration running in the front drum only, in the rear drum only, in both drums, or no vibration. VO stands for vibration in the front drum and oscillation in the rear. Hamm's CompactLine offers hydrostatic dual drum drive, automatic/manual vibration system, hydrostatic articulated steering and excellent maneuverability. Key features of the CompactLine include its excellent visibility to the drum edges, as the engine is mounted lengthwise and not sideways in the frame, low profile, and ease of handling. 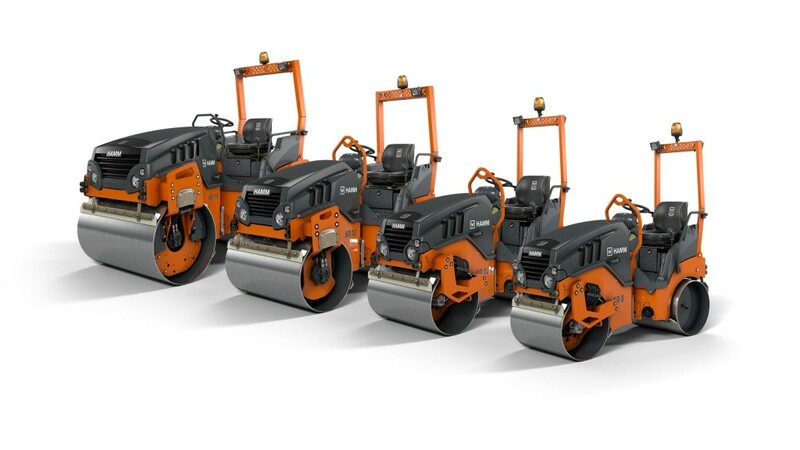 Its superb driving characteristics are due to its unique three-point articulation that maintains even weight distribution across the drum width, even in tight turns, thus reducing cutting on the asphalt surface, and its high compaction force and low centre of mass. The operator platform is fully insulated against vibration, thus improving comfort levels. The operator's seat, steering column and tread plate are mechanically isolated from the framework, which significantly reduces vibration and makes working with the CompactLine even more pleasant.